unites software, electronics and hardware, helping you monitor and automate things. 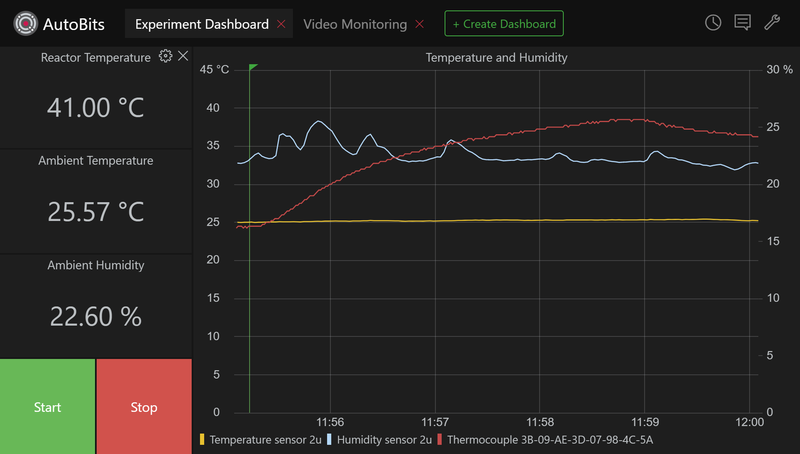 With AutoBits you can receive data from sensors or via APIs, control devices and software, visualize data on dashboards, create automation scenarios, process and filter the data. Ideal for makers, electronics enthusiasts and labs in data acquisition, control, test, prototyping and R&D applications. We strive to make AutoBits intuitive and easy to use. AutoBits goal is to minimize convoluted hardware interconnections, complicated software set up and configuration; reduce the need for programming. It lets you focus on the task at hand while handling the technical part. AutoBits brings together, connects and controls the devices you need. Hardware building blocks: sensors, detectors, indicators, actuators, contactors, relays, motor drivers, ADCs, DACs and more, cover a wide variety of applications. AutoBits supports many popular protocols out-of-the-box. Thanks to AutoBits extensibility, more protocols are added with every update. It works with AutoBits hardware as well as hardware made by others. AutoBits can help you conduct experiments that require automated control based on sensor data. It acquires the data and controls the experiment parameters via relays, motors and actuators. AutoBits will handle data acquisition, processing, control and automation so you can focus on the experiment and science. Contact us if you need our help with your experiment setup. Wake up light, Sous-vide, Reflow oven, Energy monitoring, Air quality monitoring, Automated hydroponics system or home automation system. Most of such projects need sensors, some form of data processing, control, and visualization. We made AutoBits to handle these common tasks. Give it a try.